TÁNAISTE JOAN BURTON has remained adamant that the Government will survive its term in office. Reports at the weekend suggested that some in Fine Gael have mooted the possibility of calling an early vote, but is something strongly opposed by Taoiseach Enda Kenny. 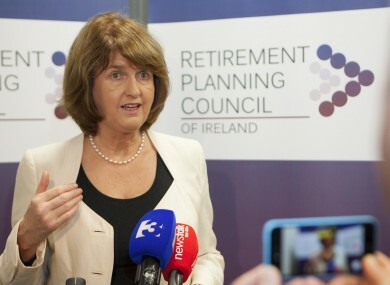 Speaking to reporters this afternoon at the launch of a report by the Retirement Planning Council of Ireland, Burton said that Labour is preparing for an election, but it envisages that it will take place in 2016. We also have a social recovery to implement, so I’m looking forward to in next year’s Budget actually continuing with the progress made in this year’s Budget. The Tánaiste described the measures coming into effect in the coming weeks as “small starts”, but significant for those who will benefit. Burton also wouldn’t be drawn on whether she expects a repeat of the Jobstown protest, and said she has ‘co-operated fully with gardaí’ investigating. Email “Joan Burton: Labour will see out its term in office ”. Feedback on “Joan Burton: Labour will see out its term in office ”.